Pakistan Navy Polytechnic Institute (PNPI) Karachi Sindh. 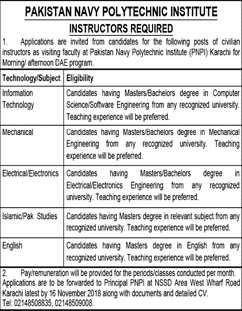 Applications are invited for the following Posts of Civilian Instructors as Visiting Faculty at Pakistan Navy Polytechnic Institute (PNPI) Karachi for Morning/afternoon DAE Programmes. Qualification: Candidates having Master/Bachelor Degree in Computer Science/Software Engineering from any recognized University. Qualification: Candidates having Master/Bachelor Degree in Mechanical Engineering from any recognized University. Qualification: Candidates having Master/Bachelor Degree in Electrical Engineering from any recognized University. Qualification: Candidates having Master/Bachelor Degree in Electronics Engineering from any recognized University. Qualification: Candidates having Master's Degree in the relevant subject from any recognized University. Qualification: Candidates having Master's Degree in English from any recognized University. 1. Pay/Remuneration will be provided for the periods/classes conducted per month. 2. Applications are to be forwarded to The Principal (PNPI) at NSSD Area, West Wharf Road, Karachi, latest by November 15, 2018, along with documents and detailed CV. NSSD Area, West Wharf Road, Karachi.